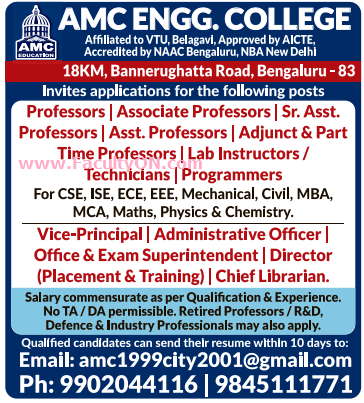 AMC Engineering College, Bangalore has advertised in DECCAN HERALD newspaper for recruitment of Professor / Associate Professor / Sr.Assistant Professor / Assistant Professor / Adjunct & Part-Time Professor / Vice-Principal Plus Non-Faculty jobs vacancies. Interested and eligible job aspirants are requested to apply within 10 days from 27th June 2018. Check out further more details below. About College: AMC Engineering College was established under the Paramahamsa Foundation Trust and located in Bannerghatta National park road. The campus has spread out in 52 acres of land with unique style of buildings for each department.